Asunción Demartos born in Seville in 1975 graduated from Seville Higher Conservatory of Dance in Spanish Dance, Classic Ballet and Choreography Technique in 1992, and she has more than 20 years of professional experience as a Flamenco Dancer. 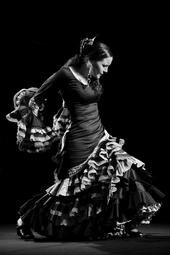 Her professional career is supported by her work at very renowned ‘Tablaos’ from Madrid, Tokyo and Seville such as Café de Chinitas, Corral de la Morería, Casa Patas, El Flamenco, Los Gallos or El Arenal. In her career she has shared the stage with Eva Yerbabuena, Arcángel, Adrián Galia, Blanca del Rey, María Vargas, Manuel Liñán, Lola Greco and Rafael Amargo, amongst others. In 2001 she began her solo career, highlighting amongst her shows: “Ella” (Her) which premiered in Seville as part of the Larachí Flamenca concert series and later in an international tour across Norway; “Alma de Luna” (Moon’s Soul, 2005); “Orígenes” (Origins, 2007) within the Yecla (Murcia, Spain) Flamenco Festival and at the Cervantes Theater in Béjar (Salamanca, Spain); “Íntimo” (Intim, 2008), “Sie7e” (Seven) performed for the first time on July 31th 2009 within the “Mujeres del Planeta” Festival. She has been featured in several national and international cultural publications. Semifinalist as choreographer and performer in the XVI Spanish Dance Choreography and Flamenco Contest at the Albéniz Theater (Madrid). Semifinalist in the “Tienes Talento” (Got Talent) TV show. Image of Aurora Gaviño’s Flamenco Fashion Firm for SIMOF ’08 ’09 ’10 and ’11 (SIMOF, Seville’s Flamenco Fashion International Trade Show). In 2009 she inaugurated New Delhi’s Cervantes Institute, by performing the show “Sangre Nueva, Jóvenes Flamencos” (New Blood, Young Flamencos). This show was produced by Paco Ortega, and was later performed in Beirut, Amman and Tripoli, and also in Madrid, at well-known theaters such as the Español Theater, Madrid Theater, and Federico García Lorca Theater, amongst others. From 2007 to 2009 she taught Flamenco and performed shows in the Museo del Baile Flamenco (Flamenco Dance Museum) de Cristina Hoyos in Seville. Within the Seville Flamenco Bienal Off 2010, she participated in the “Flamencos Anónimos” (Anonymous Flamencos) show series at the Cajasol Theater. Not only does she teach and perform Flamenco, but she also likes to integrate painting and poetry in her work. This artistic fusion gave birth to the show “Pinceles y Cuerdas” (Brushes and Strings), that includes on one stage different art disciplines such as composed music, painting, poetry, dancing and flamenco. In the same way the show “Viento del Pueblo” (People’s Wind) was born as a tribute to the renowned Spanish poet Miguel Hernández, which was performed for the first time on January 9th 2011 at the Café del Casino in Seville. 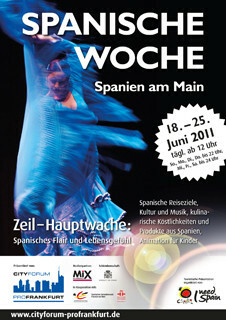 Five months later, she traveled to Frankfurt to participate in Spain’s Week organised by the Cervantes Institute, performing again “Sangre Nueva, Jóvenes Flamencos”. This show was performed one more time in Budapest in December 2011. She is currently working on her last show “Bailaora”, where she comes back to the purity and roots of the Flamenco Palos (flamenco styles), as well as the essence of this art.